In this episode of Perspectives in Healthcare, Jordan Carr and Aaron Patnode of Blue Zones Project Oregon sit down with Scott Clapson to talk about their organization and what it means to our community. Jordan helped his home community back in Iowa become a Blue Zone before he moved to Oregon to become a full-time Blue Zone advocate. He describes Blue Zones as getting back to basics. The Blue Zones project meets communities where they are and helps them expand the things that they are already doing right. They work with communities, focusing on small, easy ways to improve the health of community members. Jordan, Aaron, and Scott discuss the importance of being connected to one another and how the theme of connectivity permeates the Blue Zones Project. 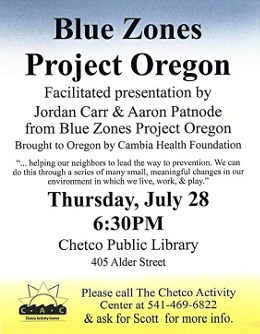 The Chetco Public Library large meeting room was full to capacity with 80 people in attendance on the night Jordan and Aaron talked about Blue Zones Project Oregon in a open meeting for community members. The Brookings Harbor Blue Zone Exploratory Coalition thanks Jordan and Aaron for a great evening. You can learn more at https://oregon.bluezonesproject.com. Take the Blue Zones pledge at https://oregon.bluezonesproject.com/pledge. In this episode of Perspectives in Healthcare, Community Organizer Scott Clapson shares with our listeners information about the Brookings-Harbor Blue Zones Exploratory Coalition. The Blue Zones Project Oregon is a community-wide wellbeing improvement initiative to help make healthy choices easier for Oregonians. The Blue Zone Exploratory Coalition is expanding everyday with community members who are interested in spreading the word and creating a common language around Blue Zones. The goal is for Brookings-Harbor to become a Blue Zones Project Oregon Demonstration Community. Here is a video link explaining more about Blue Zones Project Oregon: https://youtu.be/0V4uooM4lBQ. Take the Blue Zone Pledge at oregon.bluezonesproject.com/pledge. 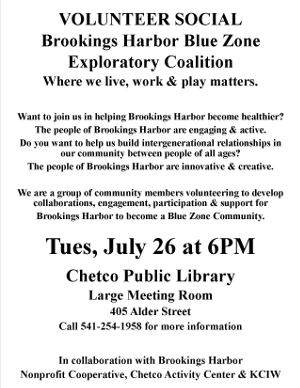 Two important Brookings-Harbor Blue Zones Exploratory Coalition meetings will take place during the week of July 24, 2016. 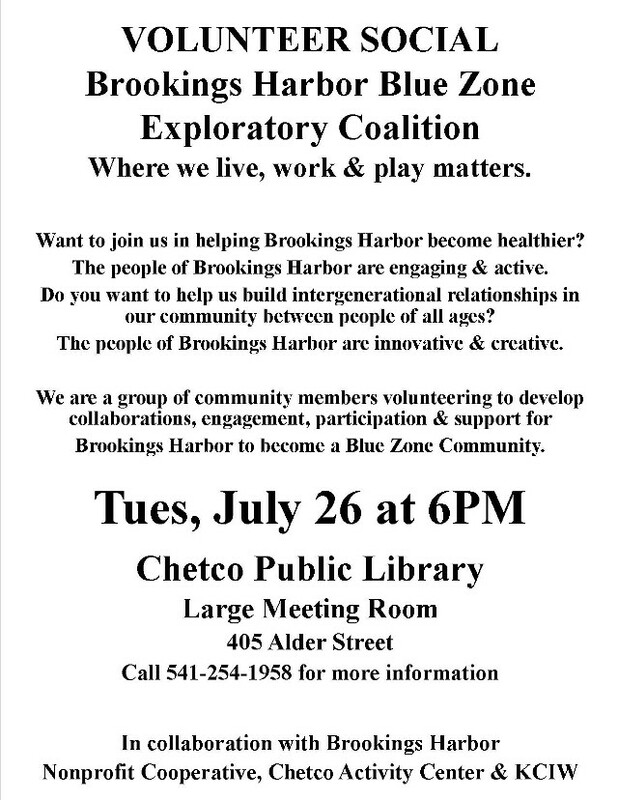 The first meeting is an excellent opportunity to find out more about the Brookings-Harbor Blue Zones Exploratory Coalition and to get involved in this important initiative. The meeting will take place on Tuesday, July 26, at 6:00 PM in the Chetco Public Library Large Meeting Room. 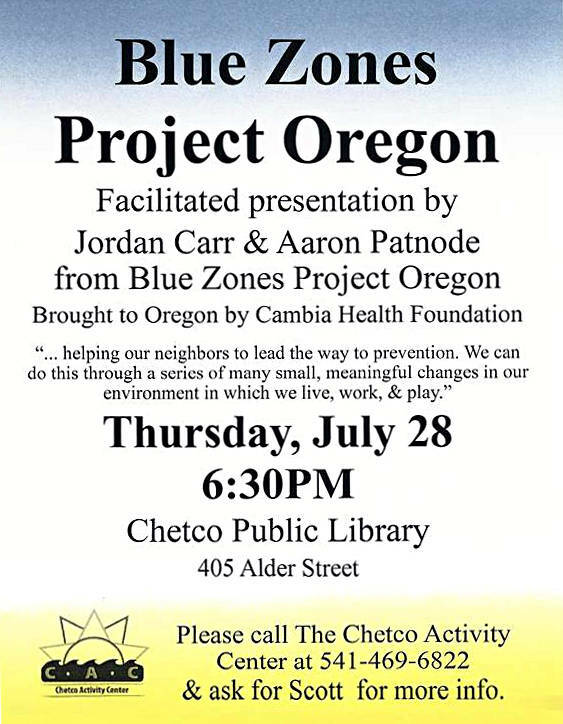 The second meeting is an opportunity to meet Blue Zones Project Oregon leaders Jordan Carr and Aaron Patnode. This meeting will take place on Thursday, July 28, at 6:30 PM in the Chetco Public Library Large Meeting Room. Don’t miss this special opportunity to help make Brookings-Harbor a better place to live for everyone in our community. In this episode of Perspectives in Healthcare, Stephanie Polizzi of Oregon State University Extension sits down with Scott Clapson to talk about the Blue Zones Project Oregon and the social determinants of health. Stephanie and Scott discuss the Blue Zones project and how our environment and personal relationship with family, friends, and faith communities can really make a difference in our lives in regard to health and longevity. 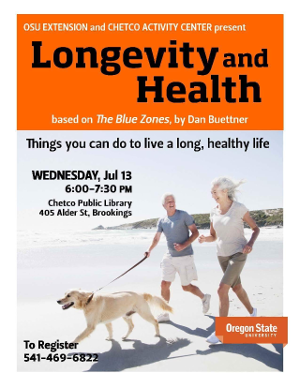 Stephanie will deliver a presentation on Blue Zones and Longevity and Health on Wednesday, July 13th, at 6:00 PM at the Chetco Public Library Large Meeting Room. Stephanie teaches a wonderful series of classes at the Chetco Activity Center where she first presented this class to residents of Brookings Harbor. 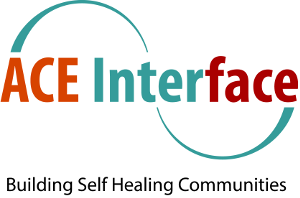 In this episode of Perspectives in Healthcare, Kathy Adams and Laura Porter from ACE Interface sit down with Scott Clapson to talk about the ACES Study and the Self-Healing Communities Initiative. The ACES Study found correlations between early childhood trauma and poor physically health outcomes and shorter life expectancy. Their work helps gather the collective wisdom of the community to create positive social change through the people themselves coming together around common goals. The Self-Healing Communities Initiative is excited to include Curry County and our people in this important project. Thank you to AllCare Health and Jackson Care Connect for funding the Self-Healing Communities Initiative. You can co-host a TED Talk video on ACES for your church, nonprofit, volunteer group, or friends and family. 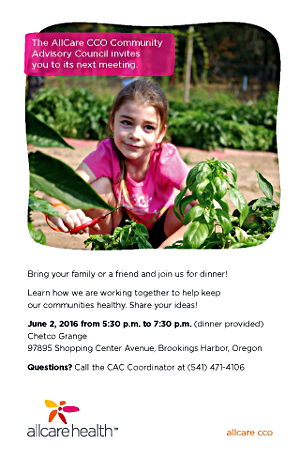 For more information and to get involved, contact Scott Clapson 541-254-1958 or scottclapson@yahoo.com. In this episode of Perspectives in Healthcare, Sara Crowell from Curry Community Health sits down with Scott Clapson to talk about the Community Health Survey. Sara shares about the importance of this healthcare survey and how we have the chance to impact services and healthcare systems by filing out this survey. Sara and Scott also talk about the social determinants of health: where we live, work, and play matters. 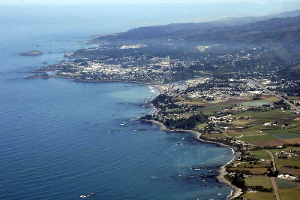 During the month of June Curry Community Health is asking residents of our county to fill out the Community Health Survey on-line at the link provided below*, or pick a paper copy up at Curry Community Health in Gold Beach, the Co-op in Port Orford, or the Chetco Activity Center in Brookings. Then attend one of the following meetings to find out the results of the Community Health Survey. * Fill out the Community Health Survey on-line at https://www.surveymonkey.com/r/curryhealthassessment2016. In this episode of Perspectives in Healthcare, Nanaymie Godfrey of Coos Health and Wellness, sits down with Scott Clapson to talk about sharing the wisdom of healthy aging communities and the Blue Zones Project. Nanaymie discusses with Scott ways we can positively share the wisdom of the elders in our community. The largest aspects of this wisdom sharing are listening, participating, and engaging with each other in our communities. Community members have a right to speak up about the needs in their area and what works well in one place maybe need to adapted to fit the needs of another community. We need to find what we have in common and come together in a unified voice. The people who have been most disenfranchised often have the most creative solutions. We need to be looking outside the current systems or we are going to replicate more of the same. Seeing the glass as half full and the opportunities for positive change is the key to resiliency. We can transform our systems of care by people caring for people. In this edition of Perspectives in Healthcare, Josh Balloch from AllCare Health, Hollie Strahm from Curry Community Health, and AllCare Health Plan Community Advisory Council member Karin Larsen sit down with Scott Clapson, Vice-Chair of the Community Advisory Council, to talk about AllCare Health’s Curry County Community Advisory Council and the innovative work they’re doing in the community. During this program they discuss the ways AllCare is collaborating with community-based organizations and other community groups to address the social determinants of health. Where we live, work, and play matters to our health and wellness. The AllCare Health Curry County Community Advisory Council is hosting a public meeting on Thursday, June 2nd from 5:30 – 7:30 PM at the Chetco Grange in Harbor. Dinner will be provided, and everyone is welcome! Come learn about the innovative community partnerships that we’re building around our county with the help of the Community Advisory Council, and share your perspective on healthcare needs in our community. A special thank you to AllCare Health for their commitment and belief in the collective wisdom of our communities in Curry County. 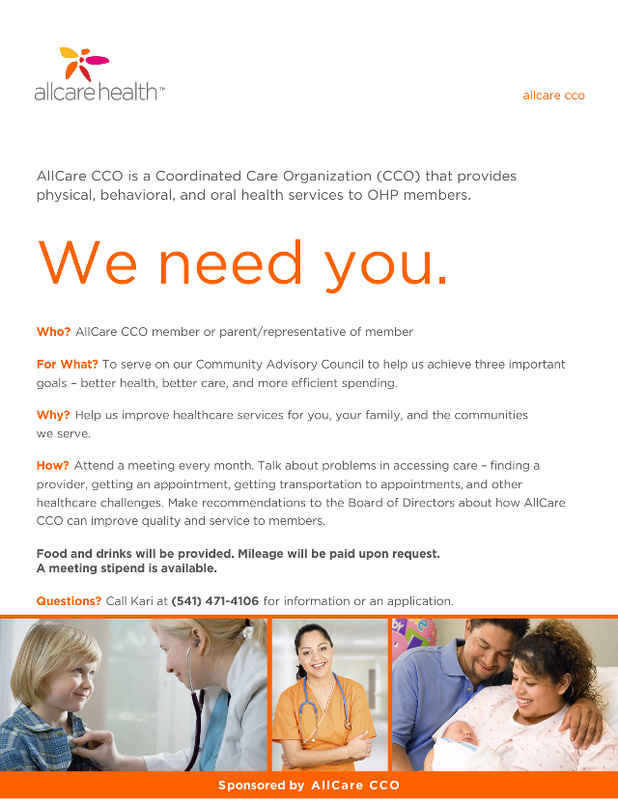 Click HERE If you’re interested in learning more about the AllCare Health Community Advisory Council for Curry County. 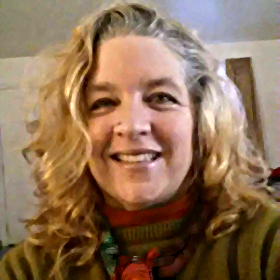 In this episode of Perspectives in Healthcare, Nanaymie Godfrey talks with Scott Clapson about her role in identifying gaps in mental health services for older adults in Curry and Coos Counties. Nanaymie shares why information from our communities in the form of the Community Assessment she has created can help us turn these needs into data we can use to improve the delivery of services for older adults. Nanaymie and Scott talk about how grief comes in waves and the importance of developing healthy support networks to help us navigate these waves of grief. Please fill out the Community Assessment form. Click HERE to download a printable survey form. Return it to Scott Clapson at the Chetco Activity Center, 550 Chetco Lane, in Brookings. Click HERE to complete the form on-line. Pick up a paper copy at the Chetco Activity Center, 550 Chetco Lane in Brookings, 541-469-6822. Nanaymie can be reached by calling Coos Health and Wellness at 541-751-2406 or emailing Nanaymie.Godfrey@chw.coos.or.us. In this edition of Perspectives in Healthcare, host Scott Clapson sits down with Laura McKeane and Kari Swoboda from AllCare Health to talk about Oregon Healthcare Transformation and the Oregon Health Plan. AllCare Health is a Coordinated Care Organization (CCO) serving Jackson, Josephine, and Curry Counties, and Southern Douglas County. CCOs are networks of all types of health care providers who have agreed to work together in their local communities for people who receive health care coverage under the Oregon Health Plan (Medicaid). Laura, who is AllCare’s Dental Health Integration Specialist, shares why dental health is important to wellness and a healthy population. Kari, AllCare’s Wellness Program Supervisor, organizes the Community Advisory Councils in Curry, Josephine, and Jackson counties for AllCare Health. Laura, Kari, and Scott talk about how we can engage in creating healthy communities and how the Community Advisory Councils are an integral part of AllCare Health’s community engagement. Click HERE If you are interested in learning more about the Community Advisory Council for Curry County. In this episode Perspectives in Healthcare, Nanaymie Godfrey talks with host Scott Clapson about the importance of building healthy social networks and how healthy social networks can help people who are experiencing social isolation. Healthy social networks are important to our mental well-being, and building them can be a challenge for those of us who are socially isolated. We can build healthy social networks by being mindful, listening, and seeking to understand other people’s motives. 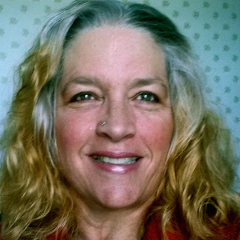 Nanaymie Godfrey is the Older Adult Behavioral Health Specialist at Coos Health and Wellness.